Snow Guards prevent the dangerous movement of frozen precipitation on a sloped roof by suspending it in a holding field so it can melt completely or drop off in small amounts. Compare Models to find which snow guard is right for you. Adding beauty and function, our clear snow guards help prevent damage from sudden avalanches while remaining practically invisible. Several important features to consider when selecting snow guards for metal roofing applications are the height, width and shape of the particular system. This determines the snow guards' ability to hold back layers of frozen precipitation to help eliminate unexpected slides. 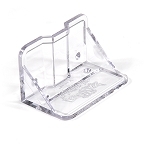 Our 30 plus years of experience manufacturing snow guards has taught us that a pad style guard should have a flat, forward mounted face that measures at least 3 inches across and stands no less than 2.5 inches high. They should always be attached on the lowest portion of the roofing panel where the frozen precipitation actually moves, not on a high seam above the problem area. Our metal roof snow guard products are a cost-effective, long lasting, aesthetically pleasing snow retention solution for any metal corrugated, standing seam, asphalt, shingle or slate roof located in a winter climate. Other products offered include leaf gutter guards, roof clamps for attaching accessories to a metal roof, vent pipe and chimney protection devices, snow guard adhesive, sealant and screws. 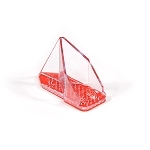 VentSaver vent pipe protectors are designed for chimney and vent pipe protection against sliding ice and snow on glossy coated roofs. 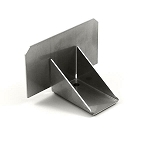 RoofClamp is an attachment solution for how to attach accessories to a metal roof panel. 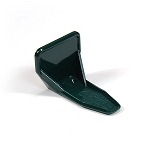 LeafBlox are fast and easy to install gutter guards. 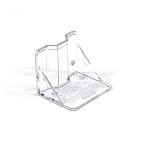 The patented SnowBreaker snow guards are one of the most distinctive new snow guard products available. At first the SnowBreaker anchors the frozen mass on the roof until melting occurs. As the metal panel warms and the snow and ice begins to turn to slush, the frozen precipitation will gradually loose its grip on the guard and begin a very slow down-hill slide. When the snow and ice starts to move on the roof, this cost effective product minimizes the danger by slicing it into small pieces so it can safely come off the roof. The forward cutting edge and the tucked back rear support form a triangular, pointed shape that acts like a fin to split up frozen precipitation. This design idea is quite contrary to the conventional snow retention systems of today which are designed to hold snow and ice on the roof by using bars or staggered holding fields. The radical new product design allows the melting snow and ice to slowly shed itself from the panel while the guard slices it into safer, smaller pieces before reaching the roof's edge. This can be especially beneficial in areas where unusual winter weather conditions can sometimes exceed the roof snow load design. In addition it can be a cost cutting solution to install snow guards in just isolated roof areas to break up the snow and ice rather than the older conventional way of retaining it on the roof until it melts. The SnowBreaker can be mechanically fastened or adhesive mounted. Because of the cutting edge design, it is not conducive to receiving significant sheer loads so we now include a peel and stick version for winter time application. Aesthetically, the SnowBreaker is extremely pleasing to the eye, easy to install and is very cost effective way to prevent damage caused by the sudden release of snow and ice. The RoofClamp is designed to address the challenges of attaching accessories such as service walks, satellite dishes, HVAC equipment, pipes/conduit, signage and photovoltaic solar modules to a metal roof panel. The RoofClamp ("RC") works on most snap lock and seamed together roofs while the RoofClamp T ("RCT") works on bulb shaped and T-Shaped panels. The clamps are made up of durable 6061-T6 aluminum and they incorporate three cup point set screws that clamp onto the standing seam metal roof. Instead of using one or two polished round point screws that could slip off the panel, the aluminum RoofClamp utilizes 3 rounded 1 ¼ X 3/8" stainless steel cupped set screws that do not pierce the panel and will not void the panel manufacturer's warranty. This rounded cupped screw is the same field proven screw that has been used on the SnoBar system for more than 20 years without ever having a callback. There is a beefy 3/8" screw for attaching roofing accessories in on the top of the clamp. 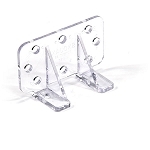 For optimum strength and ease of installation, the clamp is one piece instead of two. It is fast and easy to install, accommodates more panels and will last the life of the roof.